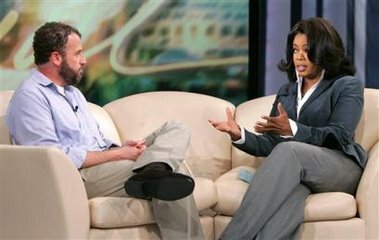 We often read the books that Oprah selects for her Book Club, like A Million Little Pieces by James Frey which was great...until today when the author admitted that he lied and as Oprah put it, "Betrayed millions of readers." Yahoo tells the tale here. Today Oprah did a live show with Frey and his publisher and a studio audience during which she pulled her Book Club Endorsement and said that she was embarassed for having supported him.